Congratulations to Tom and Mieke on the birth of their third son, Koa Thomas Dumont, yesterday morning!!!! Koa Thomas Dumont was born this morning at 5am. Baby boy & parents are great. Looks like his brothers! One more No Doubt baby in the world! The DVD is called “WICKED BEATS: Jamaican Ska, Rocksteady & Reggae Drumming”. I found it on Amazon here. Gwen’s L’Oreal hair commercial has finally shown up online. I’ve been recording random shows, trying to catch it on TV so I could upload it myself, but I haven’t seen it yet. Gwen posted a video that played in the background of the fashion show on the official site. It features some gorgeous photos of her. According to this interview, Gwen was recently photographed for the cover of Elle magazine! Can’t wait to see that! USA Today allowed readers to submit questions for Gwen for this interview. “There is a wedding going on during New York Fashion Week. The marriage is between the creativity of apparel and the technology of today’s digital age, including first ever live streaming shows, live Twitter updates from attendees, Facebook contests, instant behind-the-scenes online photos, and interactive lookbooks. You can get a taste of the ceremony at the Paltalk News network, which will have live online access starting at 7 p.m. at Paltalk.com/fashion. Paltalk will feature on-site interviews with taste makers, industry insiders, celebrities, and more, offering fashion savvy individuals a virtual ticket behind the velvet ropes. Since the experience will be in live stream format, users, bloggers, journalist of the community are urged to sign in, make their own comments, and ask the interviewees their own questions. The schedule of shows at Lincoln Center Tents during the broadcast include: L.A.M.B by Gwen Stefani, Neem Khan, Lublu, and Ivana Helsinki. If you go there, and just search for “Stefani”, it’s on the third link in the search results. Members of the band No Doubt can move forward with a breach-of-contract lawsuit against a video game developer over the use of their likenesses in the game “Band Hero,’ a state appellate court panel ruled today. The three-justice panel of the 2nd District Court of Appeal upheld Los Angeles Superior Court Judge Kenji Machida’s decision last April 15 denying a dismissal motion by lawyers for Activision. They had asked that the case be thrown out on grounds it violated the company’s right to free speech through creative expression. Machida said the crux of the suit is an allegation that the firm used the digital avatars of the band to a greater extent than allowed under a contract. “Band Hero” includes three songs from No Doubt in which players can perform as members of the group fronted by singer Gwen Stefani. Hello! 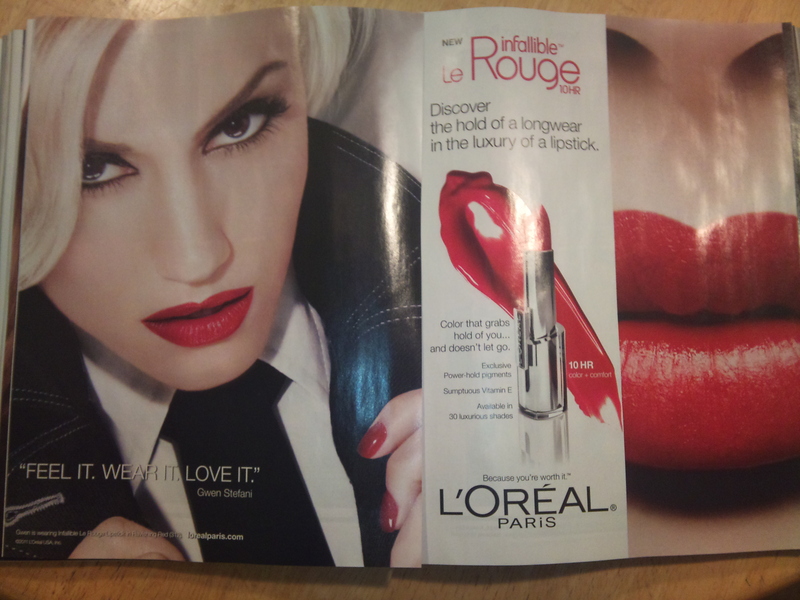 Well, I used my work scanner (shhh) to scan Gwen’s L’Oreal ad in InStyle magazine. They aren’t the best quality, but I wanted to post because Gwen made a few more appearances in the magazine. There is a photo and review of the new HL fragrance “G of the Sea”. Also, a full page featuring some of Gwen’s different looks over the years, etc. All are here in the gallery. The new, limited edition Harajuku Lovers G of the Sea fragrance is currently available at Sephora. “G of the Sea is a beautiful mermaid with gorgeous flowing hair and an adorable green tail. Inspired by the magical world of her underground playground, this new, limited-edition Harajuku Lovers fragrance features a citrusy woody-floral scent. Top notes delight in juicy splashes of crisp apple, magical water lily, and the tangy sweet surge of crushed berries. Soak in its heart, filled with flirty bouquets of dewy freesia, whispers of pink peony, and delicate kisses of jasmine petals. Finally, leave an enchanting trail of smoothly sundrenched woods, sensually transparent musks, and luscious amberwood. Crisp Apple, Waterlily, Crushed Berries, Dewy Freesia, Pink Peony, Jasmine Petals, Sundrenched Woods, Transparent Musks, Amberwood. Enchanting. Smooth. Transparent.” Sounds yummy! Italian Vogue has posted a slideshow of some behind the scenes photos from Gwen’s L’Oreal shoot, as well as an article here. More information, and an interview with the photographer, can be found here on The News-Herald web site. Apparently one of Gwen’s retro-like up-do’s is shown in a new vintage hair how-to book called “Style Me Vintage: Hair: Easy Step-by-Step Techniques for Creating Classic Hairstyles”; currently available for pre-order on Amazon . It’s release date is May 1st. “His next Grammy encounter was working with American rock group No Doubt. You are currently browsing the Greener Pastures – a No Doubt fan site archives for February, 2011.